This is the original progenitor of the well known Delicious apple from which Red Delicious arose. It was first grown on the farm of Jesse Hiatt of Peru, Iowa about 1870. The original delicious tree sprouted from seeds of Yellow Bellflower in Mr. Hiatt’s orchard. The Red Delicious we know today is a sport, or mutation of the original Delicious tree. 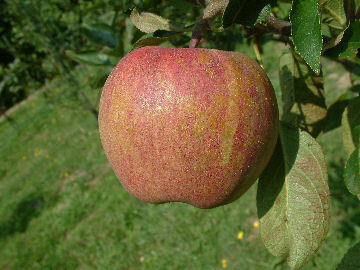 Fruit is medium to large with clear, smooth, glossy yellow skin covered with red shading and striping. The yellowish flesh is fine-grained, crisp, and juicy and immensely more flavorful than the Red Delicious. Ripens September to October and keeps until December to January. tree on M111 or similar rootstock. We apologize for the delay in replying to your message. We are dealing with a death in the family and have fallen behind in our correspondence. We do not currently have any Hawkeye trees in stock but expect to have trees available in the fall. Visit our website in September after we post our annual “List of Fall Trees”. Every fall we make available hundreds of different apple trees for those interested customers who did not or could not submit orders by the March 1st deadline. We grafted numerous Hawkeye Delicious trees this spring and should have trees available for purchase in September. Please feel free to contact us anytime if you have any additional questions. Thanks for your interest. My name is Gary Novelli & I would like to know if you will have Hawkeye Red Del. I am looking for Hawkeye Red Del. trees available for spring 2018.